Listen as these educators discuss the different education options available in Arkansas. Greg Kaza outlines many options for school choice noting their current tuition prices from all around the state. Paying tuition can be very difficult for any parent, so know how much your child's school cost, and try school choice! Listen as educators discuss the options available for you and your child's education in this Tele Town Hall. These Arkansas educators share why they support school choice and the benefits that follow the opportunity to pick where your child attends. This report examines the expected fiscal impact of the Succeed Scholarship Program in Arkansas for 2017-2018. The Hechinger Report recently published an article discussing the potential of students with disabilities to earn high school diplomas. The story was particularly interesting to us, because it highlighted that Arkansas has the nation’s highest graduation rate for students with disabilities. Over 81 percent of students with disabilities in the class of 2015 graduated, compared to the national average reported rate of under 65 percent. While this news is exciting (we love to be the best! ), we have to wonder: what is the reason for our high graduation rates? Data from the Arkansas Department of Education show that the graduation rate for students with disabilities has been over 80 percent since 2013, with the 2016 rate reflecting a new high of over 84 percent! The students in Arkansas have less severe disabilities than students in other states. Schools in Arkansas do a great job at educating students with disabilities. Students with disabilities in Arkansas can earn a diploma by meeting easier requirements than students in other states. Do students in Arkansas have less severe disabilities? Arkansas and Mississippi are close geographically, have about 500,000 students enrolled in the public school system, and a similar the percentage of students enrolled are eligible for free/reduced lunch, which is often used as a proxy for student poverty. Although student populations are similar, however, the graduation rates for students with disabilities are not. Mississippi has the second lowest graduation rate in the nation, (30.7 percent in 2015-16) for students with disabilities. Table 1 shows the 2015 special education enrollments by disability for Arkansas and Mississippi. The low-incidence disabilities, which are generally considered more severe disabilities, are presented in bold. Table 1. Students in special education by disability, Arkansas and Mississippi. Although Arkansas enrolls a higher percentage of students with intellectual disabilities than Mississippi, the developmental delay category that Mississippi uses (usually for pre-k) is likely offsetting the intellectual disability rates. Overall, differences between the disabilities identifies for students in Mississippi and Arkansas are slight, providing no plausible explanation for the 50 percentage point difference in graduation rates between the two states. Students in Arkansas do not seem to have less severe disabilities. Are Arkansas students better prepared? Arkansas’s high graduation rates for students with disabilities could be a reflection of the the quality education in schools in Arkansas are providing. The only measure publicly available to us, aside from graduation rates, on how well schools are serving students with disabilities academically is through standardized assessments. We’ll preface this by noting that no one in the special education community thinks that test scores are great measures for students with disabilities because of the variety of problems students with disabilities run into taking assessments. Nevertheless, the graduation rate, math proficiency, and English language arts (ELA) proficiency rates for students with disabilities in Arkansas and all students in the state in Table 2, below. Table 2. Graduation and ACT Aspire proficiency rates in math and ELA, Arkansas, 2016. While there is less than a 3 percentage point difference in graduation rates, there is a 30 and 38 percentage point difference in math and ELA proficiency, respectively. Although there are large differences in academic performance, Arkansas schools are graduating students with disabilities at almost the same rate as their non-disabled peers. However, as noted above, test scores are not great measures of the educational experience provided to special education students. Thus, it is certainly possible that part of the explanation for the high graduation rate for special education students in Arkansas is the quality of service provided or the attention paid to special education students in the state. Future studies could begin to test this hypothesis by comparing the special education graduation rates between Arkansas districts with different types of services provided to the students. Is it easier for students with disabilities in Arkansas to earn a diploma? Perhaps the high graduation rates for students with disabilities in Arkansas are due to less rigorous high school graduation requirements in Arkansas (compared to other states). Although Arkansas has Smart Core Course graduation requirements to help prepare students for college and career readiness, students can still graduate by completing the less demanding Core Course requirements if they have parental consent. The diploma is the same, but the requirements are different. Similarly, a study of career and technical education in Arkansas found that students with disabilities were substantially over represented in the career concentrations of “manufacturing” and “transportation, distribution, and logistics,” while most underrepresented in “finance,” “health sciences,” and “education and training.” The differences in academic expectations in these career tracks are clearly different. Every student in special education has an individual education program (IEP) that should outline their path to graduation. Some school districts state, “Those students not participating in the Smart Core curriculum will be required to fulfill the Core curriculum or the requirements of their IEP (when applicable) to be eligible for graduation.” The word “or” is important because it tells us that the IEP can take the place of both the Core and Smart Core Course requirements. If student IEP goals are used to determine whether a student earns a diploma or not, this could be the reason for Arkansas’s high graduation rates for students with disabilities. Of course, we have not done a thorough review of the rules in the other 49 states, so there may be similar alternative paths available across the nation. Thus, for now, it is certainly noteworthy that special education students in Arkansas are graduating high school at very high rates. After examining some potential reasons why Arkansas’s graduation rates for students with disabilities may be so high, we are left wondering what the implications are for our students. Policymakers and special education scholars should be examining these results so that we can better decipher whether this is good news or bad news for our state! If the results are good news, policymakers in other states should be visiting Arkansas to gain insight. On the other hand, if we are not holding our special education students up to appropriately high standards, then school leaders in Arkansas need to seek improvement. Of course, decisions regarding graduation requirements matter a great deal in the real world — there are real repercussions for students who do not earn a diploma. Moreover, there are consequences for schools, districts, and states. Washington DC is facing an investigation into its graduation practices. Since 2010, all states must use the same calculation for determining the graduation rate, but the meaning of a high school diploma still varies. Arkansas’s vision is to lead the nation in student-focused education so that every student graduates ready for college, career, and community engagement. We need to promote pathways for students to follow toward future careers and/or college, and have diplomas that match those pathways. High school graduation is only one measure of success for our students. We should also look at their experience after graduation. Education stakeholders in Arkansas, including students, parents, school leaders, and policymakers need to determine whether those high rates of graduation for students with disabilities equates to high rates of successful graduates. Special thanks to Sivan Tuchman, PhD for the research and insight for today’s blog! As confusion surrounding educational options grows, it's time the public hears more real-life stories from students and parents on how educational choice has made a difference in their lives. Millions of families have benefited from the power to choose the best learning environment for their child, but there are still more that need access to a wider variety of educational opportunities. A People's Choice winner will be chosen through public voting. 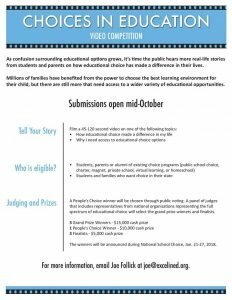 A panel of judges that includes representatives from national organizations representing the full spectrum of educational choice will select the grand prize winners and finalists. The winners will be announced during National School Choice, Jan. 21-27, 2018. For more information, email Joe Follick at joe@excelined.org. (Little Rock, Ark. – September 27, 2017) The Reform Alliance announces that 93 percent of available Succeed Scholarship Program spaces for the 2017- 2018 school year have been filled in the first month. The Succeed Scholarship Program, passed during the 2015 Legislative Session, allows a public school student with an Individualized Education Program to apply for up to $6,713 in scholarship funds to attend a private school that may be more suited to meet the student’s needs. There is a waiver that private school students can get signed by their resident superintendent to bypass the public school requirement. Over 37 percent of the eligible private schools participated in the first 12 months of the program. This increase allowed more children to have an opportunity to access educational opportunities that best fit their needs. As the new executive director of The Reform Alliance, Pruitt comes with more than 15 years of experience working with nonprofits. A long-standing advocate for educational opportunities, she is dedicated to supporting educational freedom for all children in the state of Arkansas. The Reform Alliance is a nonprofit organization dedicated to supporting school choice opportunities for all students in the state of Arkansas. President-elect Donald Trump, an open supporter of school choice, has nominated Betsy Devos for Secretary of Education. Devos was most recently the Chairwoman of the board of directors for the American Federation for Children, a lobbying, political action committee (PAC), and non-profit organization that promotes school choice across the country. This political atmosphere requires that we think critically about how school choice policies apply to the state of Arkansas. Arkansas already provides for several types of school choice. The most well-known is charter schools, which are public schools that are independently operated but receive federal and state funding and held to all accountability requirements. Currently, Arkansas has 24 open-enrollment charter schools operating 43 campuses. Another type of school choice that may be less familiar is vouchers. Arkansas has a new program allowing such vouchers for students with disabilities, and today’s policy brief examines the program and what it might mean for Arkansas. The 2016-17 school year is the first year that Arkansas’ students with disabilities could use state education dollars as tuition at authorized private schools. The Succeed Scholarship Program, passed by House Bill 1552, permits public school students with disabilities to transfer to an approved private school of their parent’s choosing with the support of the student’s full foundation funding to cover school tuition and fees. Students with an Individualized Education Plan (IEP) can apply to participating private schools, and, if accepted, receive a voucher worth the state’s foundation funding amount (currently $6,646) or school tuition, whichever is less. Approved private schools are held to academic, fiscal, non-discrimination, and safety standards. The underlying belief behind private school choice is that parents have their own goals for the education of their students and also have a better understanding of what their student needs than do school officials. In the case of special education students, this is critical because traditional public schools offer similar special education services, and parents may not feel that these services will meet the needs of their student. Moreover, students who are geographically tied to attend a poor performing traditional school should be provided the means to obtain a high quality education regardless of their family wealth. These types of choices have always been afforded to wealthy Americans, and private school choice programs afford all parents the same options. Private school choice programs (i.e. vouchers, tax-credit scholarships, education savings accounts, etc.) for students with disabilities are becoming increasingly popular, particularly in the southern United States. While most other private school choice programs target students from low-income households, programs like the Succeed Scholarship offer a private school voucher to students based on enrollment in special education. Special education has had a long history of utilizing private schools to provide appropriate services for students with disabilities. Through the IEP process, districts can place students in private schools if they are unable to properly support their academic progress. A voucher, however, takes the district decision-making out of the equation, and it allows parents to place their students in private schools on their own. There are potential cost savings from the Succeed Scholarship Program for the state and district. Students with disabilities receive funding from state, local and federal sources, but the program only allots state foundation funding for the voucher, leaving more federal and local funding available to all other students who remain in the public school system. Additionally, the current bill funds the Succeed Scholarship outside of the Public School Fund, leaving all state funding that would have gone to these students available. To some extent, we may see all of these areas as clear reasons why a program like the Succeed Scholarship should exist. An important concern, however, is that families must relinquish their rights under the Individuals with Disabilities in Education Act (IDEA) and their Individualized Education Plan (IEP) while enrolled in the Succeed Scholarship program. While parents can return at any time to the public schools or even transfer to another private school participating in the program, potential negative effects exist from a school that neglecting the special needs of a student with a disability. Another concern is that the voucher amount may not cover the entire cost of tuition at a school that will meet the student’s needs, and poor families would not be able to supplement (“top up”) the voucher. This is particularly true for students with the most severe disabilities, who cost substantially more to educate. Private schools that participate cannot discriminate in their admissions process, but they can use their normal entrance requirements, including testing, interviews, and review of records. Students with academic, social/emotional, and behavioral disabilities, may be at a real disadvantage and be de facto discriminated against, limiting their true school choices. Special education private school choice programs are often seen as a “foot in the door” for school choice laws. Once some success has been shown to the public, more laws can be passed to expand these programs. The political climate is ripe for such potential expansion, whether these programs are targeted to students from low-income households or available to all students. Eyes are on the current legislative session to see if the issue of private school choice arises once again in Arkansas. It is essential that citizens and legislators alike consider the potential costs and benefits, not just for students today but for generations to come.